This surname is a very rare variant form of the popular Olde English, Anglo-Saxon, and Germanic 'halla', which is found in its most common form as 'Hall' - a habitational or occupational name for one who lived or worked at either the local council chambers or the Lords Manor. 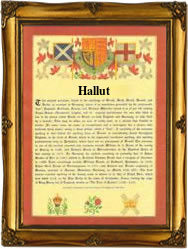 The original spelling was Heall, Halla or Holi, with variants and patronymics Hallen, Hallin, Halle, Hallex, Hallet, Hallot and Hallut, the latter being of French-Flanders origin. 'Hallt' is a very elusive variant, not being recorded in England before 1910, and only appearing once in the London Directory of 1985. It is our opinion that it is an alternative form of either (Van) Hault, Halt or Hallet, but the scarcity of recordings makes definitive linking impossible. The first recorded spelling of the family name is shown to be that of Alice Hallet, which was dated March 10th 1629, a christened at St. Giles, Cripplegate, London, during the reign of King Charles 1, known as the Martyr, 1625 - 1649. Surnames became necessary when governments introduced personal taxation. In England this was known as Poll Tax. Throughout the centuries, surnames in every country have continued to "develop" often leading to astonishing variants of the original spelling.